Who could ask for more? Blazing sunshine, a picturesque ground and two evenly matched Buccaneer sides. 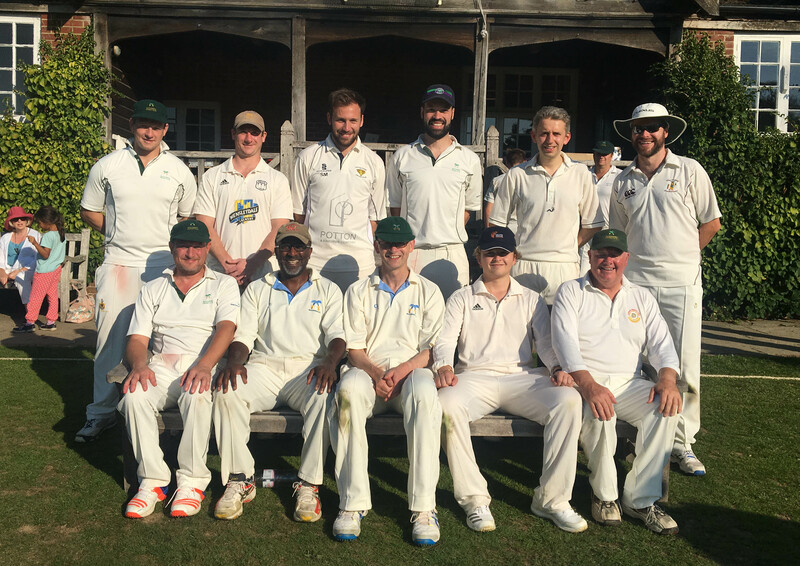 James Stringer called correctly and the Superkings had a bat against Rob Rydon’s Royals. Ollie Metcalfe and Nick Moules opened proceedings against the pace of the Milne brothers (Ludo and Casper). Pace won out as Ludo castled Nick in the fifth over. Ten overs in saw a change of bowling and Liam Ward and Tom Rydon carried on the pace attack. Liam bowled Paul Hobson cheaply and Mel Ragnauth entered the arena after too long an absence from the Buccaneers. Poor Ollie was bowled by Tom, which may have been the result of a large cheer from the pavilion as an Indian wicket fell in the Test match just as Tom was bowling. Steve Moules joined Mel at 62 for 3 off 16 overs and this was the partnership of top guns who could make or break the match. Pace was taken off the ball in the shape of Simon Leefe and John Bryant and a gentle squeeze was applied. An effective squeeze too, as lightning reactions from the young keeper, Andy Morgan, stumped Mel and later caught Steve off Simon. 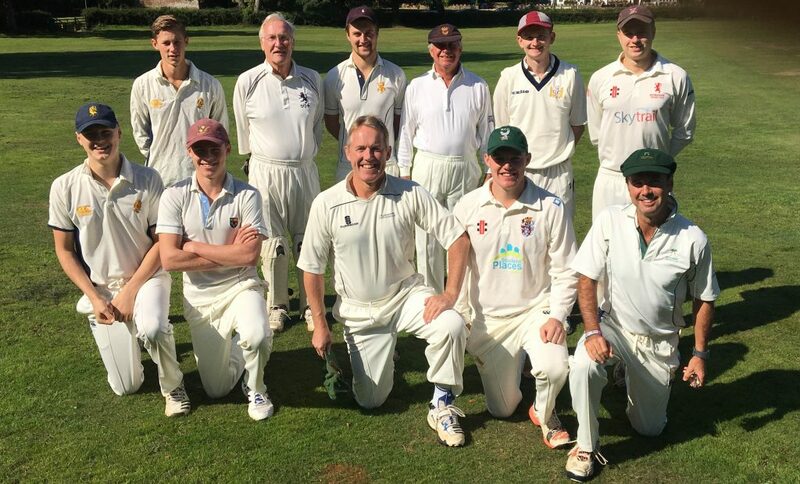 John weighed in with a wicket too, as flight and guile put paid to Tom Mackrell. Rob came on for one over before lunch to test out his ankle and pinned Will Metcalfe in front to reduce the Superkings to 111 for 7 off 30 at lunch. What a lunch it was. James had spent most of his first week at his new job negotiating with the Dog and Pheasant and it had paid off. Rare beef, thick cuts of cured ham, the finest smoked salmon and Coronation Chicken all washed down with ale and wine that President Simon Woolfries had brought. Fruit salad and flans were available for those who could find room. 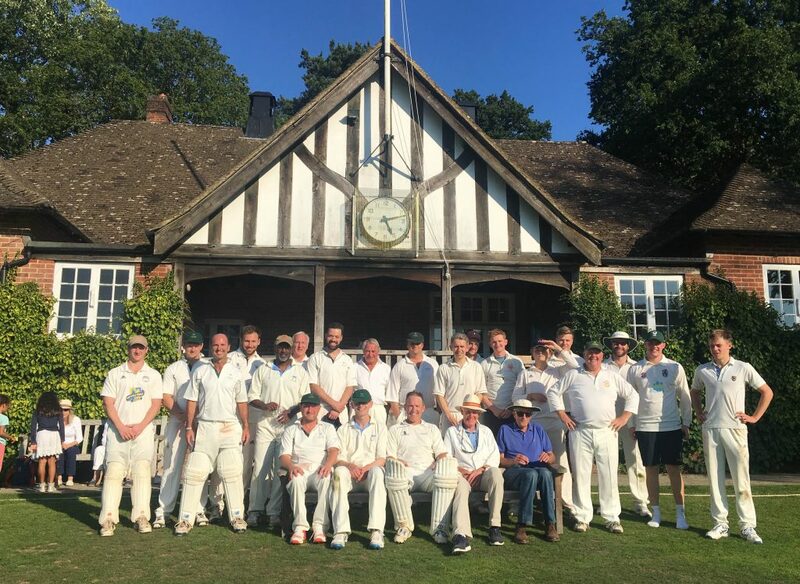 A reluctance to return to the cricket was apparent, but umpires Simon Woolfries and John Marsh chivvied the players back out. Max Sutton bowled with variety and Archie Marsh and Rhino Brandes moved proceedings along. Caspar came back down the hill to account for Rhino and Archie employed the long handle to good effect before falling to another sharp stumping with the added twist of John putting up the slow finger of death to his son Archie. Rob dropped a catch off his son, Alex’s bowling, but made amends the next over to account for James at long on to leave Warwick Okines stranded with the Superkings 146 all out. Alex and Jeremy Milne opened the batting for the Royals against the pace of Steve and Will. Steve was certainly pushing the speed gun and bowled the ball of the season against Alex with a perfectly pitched seaming delivery to smash the off bail, and I do mean smash. Once a new bail was found, Matt Bennsion lined up in his jazz hat cap. It wasn’t for long though and Will produced a fast straight low one to get one of the rare LBW’s of the day. Jeremy slashed at a wide one and was caught at point. 23 for 3 off 6 overs and both sides were in it. Rob joined Liam and they slowly began to exert some authority. Watchful defence and dispatching of the bad ball saw the total creeping up and with no scoreboard pressure, the Royals gained the ascendancy. Hobbo bowled slow and even slower deliveries and was unlucky not to get a wicket. Leg spin from the hill end, first from Warwick and then Archie saw good cut and thrust, but it was the rank full toss that accounted for Liam. Simon Leefe joined his skipper at 100 for 4 in the 24th over and after seeing himself in, dispatched the bowling to all parts, including a flat six into the pavilion wall. The Rydon Royals were victorious and James graciously presented the Mynott Thimble to Rob. A general mine sweep of the remaining beer was followed by a gentle walk over to the Dog and Pheasant and a few more pints to put the game to rest.